The Carnegie Institution for Science, Washington, D.C.
During the first half of the twentieth century, the Carnegie Institution for Science, formerly the Carnegie Institution of Washington, conducted pioneering research throughout Mesoamerica. Carnegie maps and publications represent a significant body of knowledge about ancient people and places. These works continue to rank among the most commonly cited documents by scholars and researchers. Many of the remaining Carnegie publications are housed in rare book collections or private libraries. The goals of this project are to make portions of this major body of knowledge more accessible to scholars and convert printed maps to digital format for use in modern geographic information systems. This would not have been possible without the permission of the Carnegie Institution of Washington, support from Auburn University Montgomery, the Auburn University Montgomery Library and School of Liberal Arts, and a research and education grant from the Intergraph Corporation. A portion of the data presented on this site was collected with the assistance of funding from the National Science Foundation. Welcome to the Auburn University Montgomery Carnegie Explorer. This website is designed to facilitate the distribution of data published by the Carnegie Institution of Washington, D.C. in digital format for the advancement of research. Data housed on this site, including maps and tables, are available in Microsoft Access and ESRI Shape file format to facilitate integration into geographic information systems. Maps, air photos, and other remotely sensed imagery are provided as Geo Tiff images. Sketches and architectural detail are provided as raster images. Where practical, relational tables including positional geometry are provided for map elements converted to features in vector format. Descriptions and detailed excavation reports are provided as Adobe Acrobat files. We hope you find this site useful for your specific research interest. Feel free to browse the site descriptions and links to data, imagery, maps, photographs, and reprinted material housed on the Auburn University Montgomery Humboldt Server. To gain access to data sets or download GIS-ready files, databases, and imagery, you must complete and submit a research registration form. After we process your completed registration, you will receive instructions and links to the Humboldt Server download site. Auburn University at Montgomery Carnegie Explorer and The Carnegie Institution of Washington, D.C. are to be cited as sources for any information including digital geo-referenced data downloaded from this website. Use of photographs from this site is subject to copyright laws. Please feel free to contact us with any comments or suggestions you might have regarding this site. Carnegie maps, documents, and images are reproduced by permission of the Carnegie Institution of Washington. Upcoming Publication: Dr.Terance L. Winemiller, AUM with coauthors Dr. Virginia Ochoa-Winemiller, New Jersey City University, and Jennifer Ludwig of Hexagon-Technodigit - France have submitted for publication an article entitled "Assessing Surface Correspondence and Trade of Maya Figurines and Molds Using Multistripe Laser Technology and Metrology," that will revolutionize the way archaeologists analyze form and style of clay ceramic artifacts. 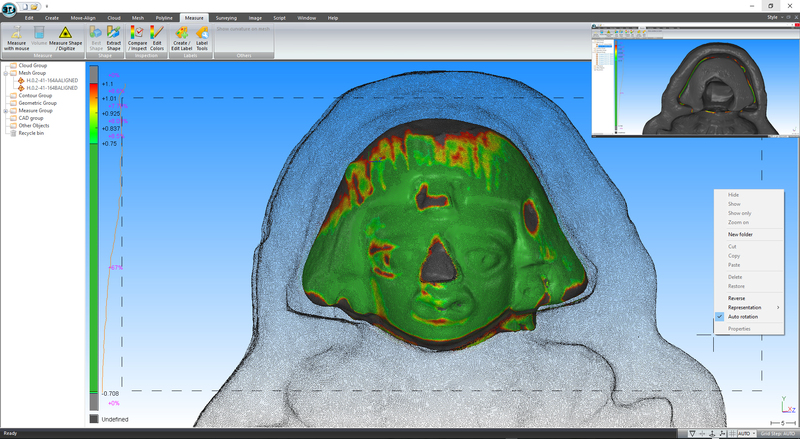 The ground-breaking method employs 3D multistripe laser scanner and metrological software designed by Technodigit to scientifically determine three-dimensional surface variation among figurines and molds and figurines and figurines to infer common source thus standardization and network interaction. Our procedure dramatically increases "confidence levels" over existing mechanical and visual methods used by archaeologists to infer common source for similar artifacts. Scientists who wish to reproduce the method are welcome to download the raw scan data (in zipfile format 3.69 GB). By clicking the link at the end of this announcement you agree that these data will be used solely to replicate methods and will not be published or redistributed in any form. Software needed to reproduce the study include ScanStudio, QA-Scan, and RapidWorks by NextEngine and 3D Reshaper by Hexagon Metrology. FigurineData. Visualizing Prehistoric Artifacts: The Auburn University at Montgomery Geospatial Research Institute in collaboration with New Jersey City University is launching a 3D Digital Catalog of Molded and Modeled Artifacts from Mesoamerica, Central America, and South America. Initially, we will be providing imagery and video rendering of objects scanned using a 3D line scanner. A sample can be found at SantaRitaVessel. We have just made Robert Wauchope's "Modern Maya Houses: A Study of Their Archaeological Significance" Publication 502,available on this server. "Mayapan Yucatan Mexico" Publication 619, the last major site publication by the Carnegie Institution of Washington, is now online. A digital copy of Publication 595, Karl Ruppert's 1952 "Chichen Itza: Architectural Notes and Plans" complete with map and Ruppert's 1935 Publication 454 "The Caracol At Chichen Itza, Yucatan, Mexico." These publications are among the most popular and sought after works produced by the Carnegie Institution of Washington, D.C. Volume I of Publication 406, "The Temple of the Warriors at Chichen Itza, Yucatan" by Earl H. Morris, Jean Charlot, and Ann Axtell Morris (1931) is now online as well. We wish to extend our gratitude to Dr. Edward B. Kurjack for sacrificing personal copies of several of the works featured on this site for the better good of Maya archaeology. A digital copy of Plate 25, a map of the site of Tulum, from Lothrop's Carnegie Publication 335, "Tulum: an Archaeological Study of the East Coast of Yucatan" published in 1924. We are working on 3D GIS reconstructions of several sites based on maps published by the Carnegie Institution of Washington, D.C. A 3D animated rendering of El Castillo at Chichen Itza based upon Ruppert's 1952 revision of the Map of Chichen Itza surveyed by J.O. Kilmartin in 1924 and 1928 and J.P. O'Neill in 1932, later published by Ruppert in 1935, serves as a preview of the work in progress. This groundbreaking work provides a unique historical perspective of Maya archaeology derived from surveys conducted by Carnegie explorers in the early part of the 20th century. Landsat TM coverage of the entire Yucatan Peninsula as well as portions of Guatemala, Belize and Honduras provided by NASA through the Earth Science Scientific Data Purchase (SDP) is now available on Carnegie Explorer. Currently, 18 scenes are available for download to registered visitors. Additional coverage will be on line in the near future. Registered users having specific research needs may request spatial subsets in various band combinations. Contact twinemi1@aum.edu for additional information. AIRSAR coverage of portions of the Yucatan Peninsula and Central America will soon be available on Carnegie Explorer by permission of NASA JPL. Currently, a 3D video preview is available for viewing. Additional coverage will be on line in the near future. Registered users having specific research needs may request spatial subsets in various band combinations. Contact twinemi1@aum.edu for additional information. During the summer of 2007, we spent two months working in the Telica Valley near the towns of Juticalpa and San Francisco de La Paz, Honduras. Forty-three archaeological sites in the region were added to the "Atlas of Mesoamerican Sites" which you can find on this website. Read more about the 2007 fieldwork in eastern Honduras and opportunities for students to participate for academic credit in the 2008 research program. Contact twinemi1@aum.edu for additional information. Faculty and students in our GIS program have been mapping several walking and jogging trails on the campus of Auburn University at Montgomery. Currently, there are two one mile and one two mile trails which course through a variety of microenvironments. The trails are marked and signed so visitors can keep track of their location on the path. A Google KML file can be downloaded to your smart phone or IPod to track your progress in real time; Google Earth App required. Click the icon below to track your progress along the course in Google Earth. Auburn University at Montgomery is pleased to announce the launching of a new website, The Alabama Virtual Old Federal Road Project which is the result of the collaborative efforts of researchers from Auburn University at Montgomery, the University of South Alabama, and Auburn University. The project was funded by a grant from the Alabama Cooperative Extension Service. Auburn University at Montgomery is internationally recognized as a leader in GIS research and education. We are pleased to announce programs in Geographic Information Systems (GIS) and Geographic Information Science GISc for undergraduate and graduate students. In addition to the Bachelor of Science in GIS and Master of Science in GIS, Auburn University at Montgomery offers a five-course intensive study program, at the graduate or undergraduate level, leading to a Certificate in Geographic Information Systems which satisfies the academic requirements for certification by the Geographic Information Systems Certification Institute (GISCI). In addition to a world-class educational experience, our students have opportunities to travel abroad and gain hands-on knowledge using the latest geospatial data acquisition technologies including unmanned aircraft systems. A PowerPoint presentation describing GIS and the certificate program is available on this website. Check the video below to see what our students and faculty have to say about the GIS program at AUM. Contact twinemi1@aum.edu for additional information on opportunities in GIS at Auburn University at Montgomery. Becan Becan is located in the eastern portion of the State of Campeche, Mexico. The site's central precinct, bounded on all sides by a deep trench or moat, covers 0.26 square kilometers, as mapped by the Carnegie. Becan is located at 16Q 239501mE, 2049231mN UTM, 18 ° 31’ 03.23” North, 89 ° 28’ 02.70” West. Carnegie archaeologists Ruppert and Denison, Jr. were the first archaeologists to survey and map the compact site core. Ruppert described the site on pages 54 through 62 of Publication 543. Calakmul The central precinct of Calakmul was constructed on a 2.5 square kilometer hilltop. Structure 1 is located at 16Q 202791mE, 2003862mN UTM, 89 º 48’ 29.57” West, 18 º 06’ 11.35” North. Lundell published the first map of Calakmul in 1933. In 1943, Ruppert and Denison, Jr. of the Carnegie Institution published a map of the central precinct of Calakmul, surveyed by Bolles during one of four expeditions from 1932 to 1938. The site was described by Ruppert on pages 13 through 23 of Publication 543. Chichen Itza The Grand Plaza at Chichen Itza is located at 16Q 336626mE, 2287858mN UTM, 20 ° 40’ 58.89” North, 88 ° 34’ 06.76” West. 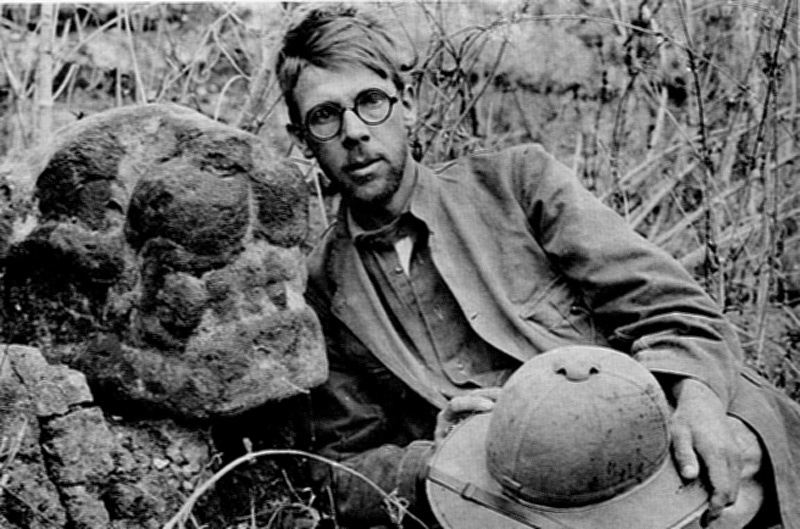 In 1924, archaeologists from the Carnegie Institution launched a major investigation at the site under the direction of Sylvanus G. Morley. Chichen Itza served as the base camp for projects described in Publication 543. The Carnegie published maps and sketches of Chichen Itza in 1932, 1934, and 1952. Ruppert's introduction to the work appeared on pages 1 through 3 of Publication 595. 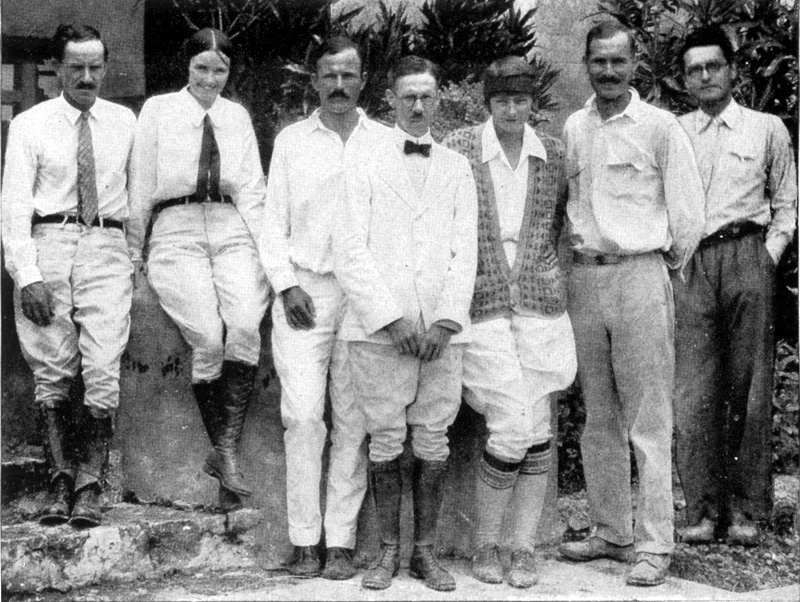 La Muneca Bolles and Ruppert of the Carnegie Institution's First Campeche Expedition initially visited La Muneca on April 23, 1932. From March 11 to 18, 1933, the site was surveyed and mapped by the Second Expedition. The small, compact, and "carefully oriented" site is located at 16Q 229607mE, 2016228mN UTM, 18° 13’ 06.03” North, 89° 33’ 24.5” West. Ruppert described findings from both Carnegie expeditions on pages 24 through 27 of Publication 543. Mayapan El Castillo at Mayapan, a small-scale replica of the four-sided stepped pyramid having the same name at Chichén Itzá, is located at 16Q 243561mE, 2283086mN UTM, 20 º 37’ 46.21” North, 89 º 27’ 39.07” West. Carnegie archaeologists visited and surveyed the great wall surrounding Mayapan in 1938. Jones surveyed the site from 1949 through 1951. The map was revised to include a large-scale map of the central precinct drawn by Proskouriakoff (1957) and published in 1962. Pollock summarized investigations at Mayapan on pages 1 through 22 of Publication 619. Rio Bec The Carnegie expeditionary team surveyed Rio Bec from March 30 to April 17, 1933 and March 10 to 15, 1934. Structure 8 is located at 16Q 250748mE, 2033107mN UTM, 18° 22’ 23.96” North, 89° 21’ 32.26” West. The site, as mapped by the Carnegie, covers 0.38 square kilometers. An architectural style marked by high towers and false stairways and doorways is named after the site. Ruppert documented discoveries at Rio Bec on pages 29 through 36 of Publication 543.